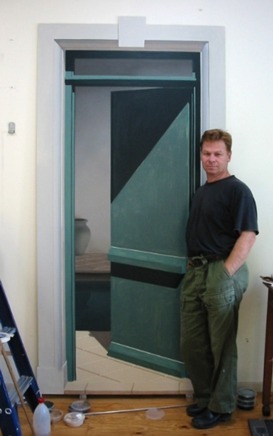 Me in front of "Green Door" in progress. I was born in Sydney, Australia in 1954. Like most artists, I began drawing at an young age, and my earliest memory relating to art, is drawing huge Disney characters on my bedroom wall. In retrospect, I'm surprised and grateful that my parents allowed me do it. I continued drawing, mainly with pencil or pen, throughout my youth, and unsuccessfully tried oil painting around the age of 14. I can only remember doing two oil paintings before the age of 17, but then something fell into place, giving me a sense of control of the medium that I hadn't had before. I settled in Melbourne in 1974, at the age of 20, and soon discovered an unrelenting passion for painting that has stayed with me ever since. It had become the centre of my life. By 1980 I was represented in the first of several exhibitions. After a friend had remarked on some incorrect perspective in one of my paintings, I began studying it in more detail. This gave me insight into a way to involve the viewer more directly in my paintings. I wanted the viewer to be able to look into a painting as if looking through a window, and be able to look around in it as if looking around in real life. I realized that there was a direct mathematical correlation between a viewpoint and the objects in a painting which eventually led to my developing formulas for application with perspective. This was very different from applying perspective in a geometric way, and different from anything I had seen before. Little did I know that I was embarking on a similar system that is used in computer graphic these days. As the formulas grew and became more complex, so did computers, which allowed my system to eventually became a type of clunky CAD software. Around 1988 I began working in affiliation with a company called Fresco Site Specific Art, painting trompe l'oeil murals. It was an easy transition because my interest in perspective was directly applicable to trompe l'oeil. Painting them with oils was too expensive, so I began using acrylic paint and an airbrush. I moved to South Australia in 1991 and continued to paint murals and some fine art until I became dangerously ill in 2004, making me re-evaluate what I wanted to do with the rest of my life. Luckily I survived and decided to give up painting murals and concentrate on painting canvases for exhibition which I have been doing since. I currently live in Tasmania and continue to paint in oils and exhibit in Melbourne. I have never had any formal training and acquired most of my knowledge from observation, experimentation and trial and error, as well as studying books about perspective, light and mathematics. I approached learning to paint with one main aim; to refine my technique enough to be able to create a realistic representation of anything that I may imagine or dream.